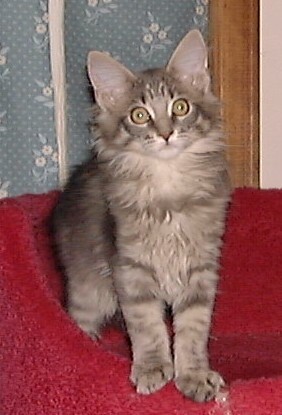 A blue mackerel tabby and white male, "Tennessee"
A blue mackerel tabby and white female, "Alabama"
A blue classic tabby and white female, "Georgia"
A blue mackerel tabby female, "Mississippi"
The following photos were taken at 13 weeks of age. We tried getting all the kittens in the same place again, but it was impossible... they were way too busy! This is Georgia. 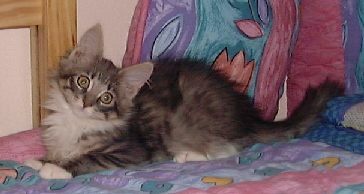 She's a blue classic tabby and white female, the smallest and spunkiest kitten in the litter. 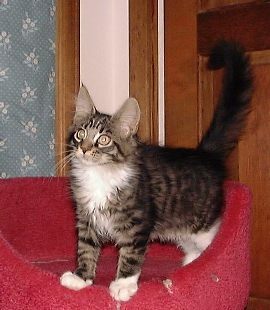 She is friendly and affectionate, and despite her size, she knows exactly what she wants -- and usually gets it! Georgia has no problem holding her own with the Three Galoots (her rowdy brothers). In fact, when she is determined to get The Current Toy, they get out of her way! 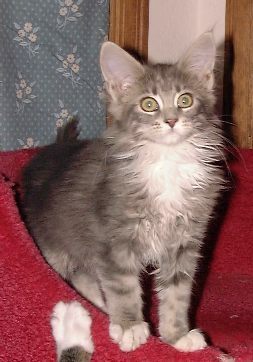 Mississippi is a blue mackerel tabby female, very quiet and gentle. Although Missy can be somewhat reserved with people she doesn't know, she's a real sweetheart once she's comfortable. 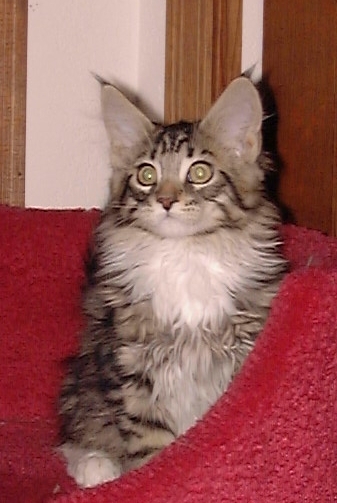 (Her temperament is very similar to her mother's.) Mississippi is our daughter's favorite, and she is constantly being picked up and carried around like a baby -- which she tolerates with the gentle grace that's fast becoming her hallmark. 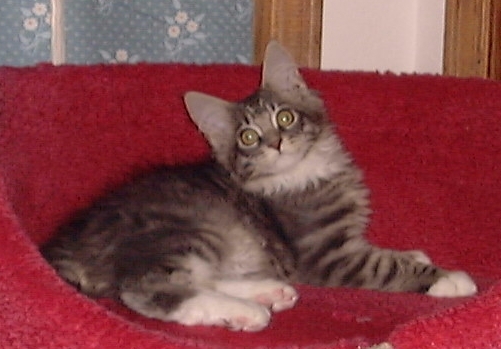 Alabama is a blue mackerel tabby and white female. She tends to hang back and watch her siblings play -- she hates ending up underneath her obnoxious brothers. But when those pesky rough-and-tumble boys are out of the way, Allie blossoms into a playful little girl. She especially loves feather toys, and once she gets hold of one -- it's hers!